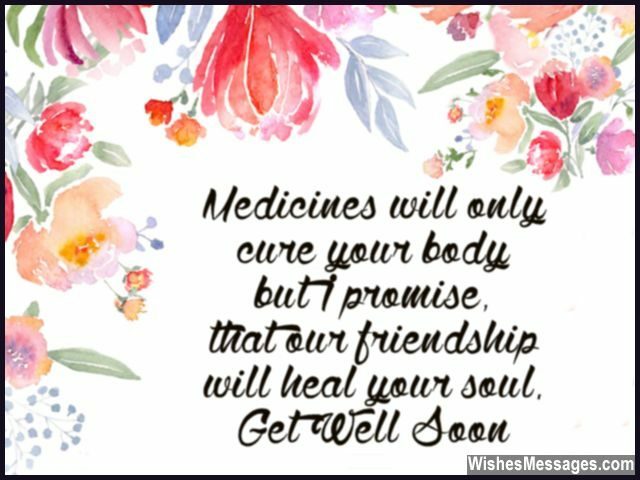 Get Well Soon Messages for Friends: Help your friends recover by posting inspirational quotes on their Facebook, sending flowers, tagging them in cute tweets and sharing funny stuff on Pinterest. Friendship is all about standing together in times of need, and sickness is when your best friends need you the most. Good vibes and wishes that come straight from the heart can make a world of a difference in someone’s recovery. Even a thoughtful handwritten note or a greeting card sent along with a box of chocolates can make someone feel better. Beautiful words have the power to make people smile. In times of illness, your words can do what no medicine can… heal from within. 1) Medicines will only cure your body but I promise, that our friendship will heal your soul. Get well soon. 2) I checked your doctor’s prescription and it was lacking the most important medicine of all – the company of a BEST FRIEND. Get well soon. 3) You can NEVER predict when you fall sick, but you can ALWAYS bank on friends like me to be by your side. Get well soon. 4) You were always a tough person and I know that coming out of your illness will only make you tougher. 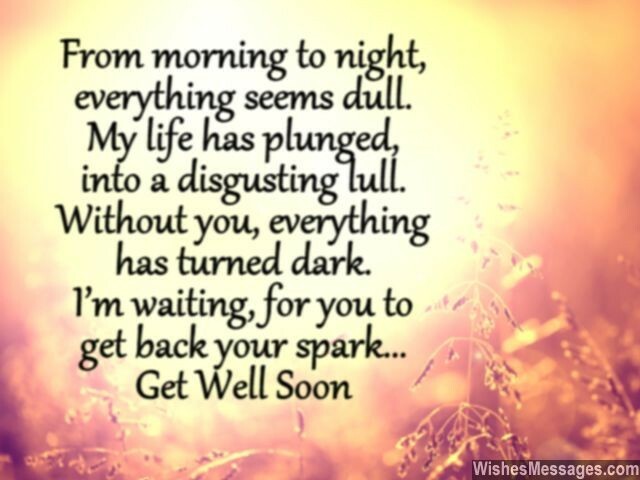 I wish you a speedy recovery. 5) The absence of your laughs and cheers, makes me feel like I am in a party without beer. Get well soon my friend. 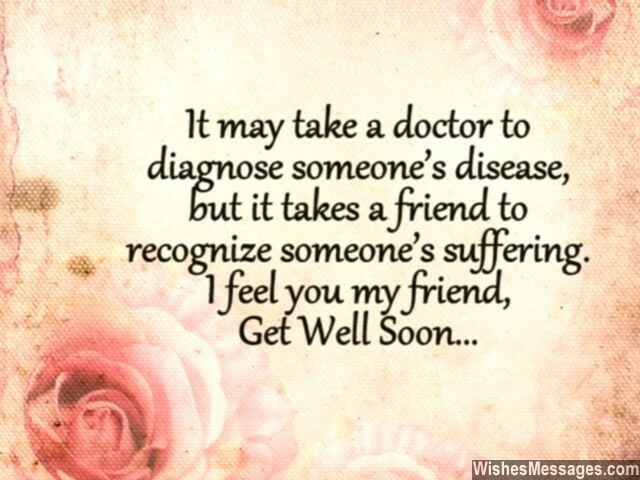 6) It may take a doctor to diagnose someone’s disease, but it takes a friend to recognize someone’s suffering. I feel you my friend… get well soon. 7) Don’t worry, I am taking boxing and karate classes so that I can punch and kick you illness away. Get well soon my friend. 8) All your HOT fever needs to heal, is the company of a COOL friend like me. Get well soon. 9) Not even cancer is strong enough to fight off the wishes and prayers of friends like me. Get well soon. 10) I wish you well not just because you are my friend, but because you are such a good human being. Get well soon. 11) From morning to night, everything seems dull. My life has plunged, into a disgusting lull. Without you, everything has turned dark. I’m waiting, for you to get back your spark. Get well soon. 12) I feel your pain, I wish you never fall sick again. It will all be over soon don’t worry, I know that you will have a speedy recovery. 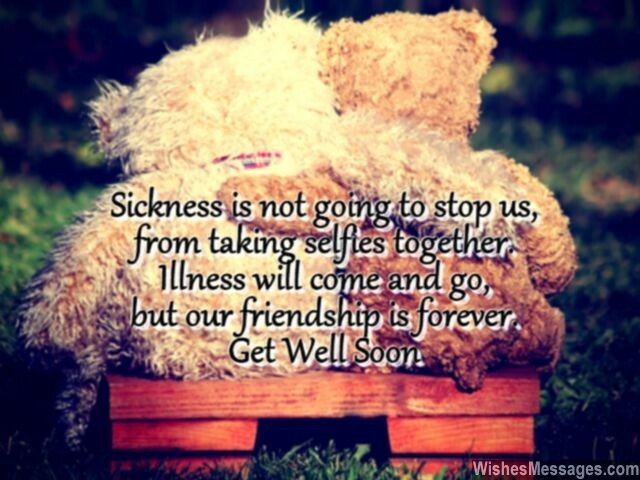 Our friendship will make you immune, so you have no choice but to get well soon. 13) To the friend who is simply the best, I prescribe lots of love and rest. To the friend who’s always kept me happy, I wish a speedy recovery. Get well soon. 14) Your illness has confirmed my doubts that you are an attention seeker all the way. Get well soon cry baby. 15) Just think about the SWEET memories of our friendship… it will make the BITTERNESS of your sickness go away. Get well soon. 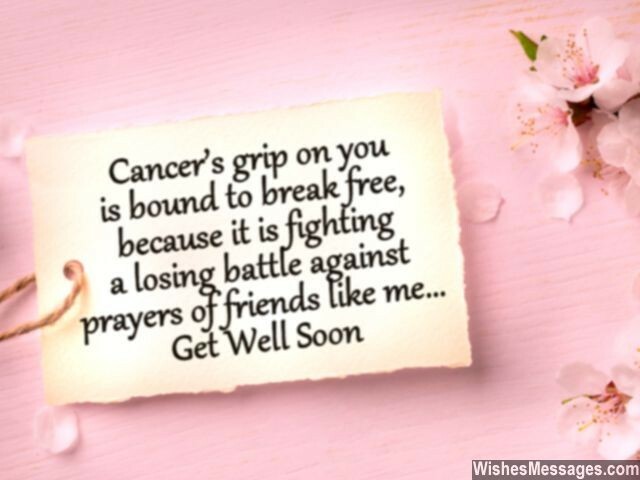 16) Cancer’s grip on you is bound to break free, because it is fighting a losing battle against prayers of friends like me. Get well soon. 17) All you need is the comfort of the warmest blanket known to mankind – Friendship. I am here, get well soon. 18) If I could be anything I wanted just for day, I would be the warm soup that you can sip to drive your illness away. Get well soon. 19) For your illness, a few candies and flowers may not be the perfect cure. But they will cheer you up for sure. Get well soon. 20) You feel sick because your body needed some rest. Let’s just hope that whatever happened, was for the best. As soon as you feel better and you’re back on your feet, we’re going to party as soon as we meet. Get well soon. 21) I know you’re sick, but that’s not going to stop us from taking selfies together. Illness will come and go, but our friendship is forever. 22) I don’t want to boast but I can give you something the doctor can’t – warm hugs and precious smiles. Get well soon. 23) Dear friend… When you laugh, I laugh. When you cry, I cry. When you smile, I smile. When you frown, I frown. When you fall sick, I fall sick. But when you feel better, I do too. So, get well soon. 24) I wish that you can quickly leave that hospital bed, and spend that time with me instead. Your presence in my life makes me tick. How dare you fall sick? Get well soon. 25) I have come with my magical powers so that you don’t feel sick. FRIENDSHIP, is the name of my powerful healing technique. I’m here now, to keep sickness at bay. In no time, you’ll be laughing and smiling away. Get well soon. 26) I am not a doctor so I don’t know how to bring an end to your illness. But I am your friend so I definitely know how to bring a smile on your face. Get well soon. 27) I am sure you will soon be up and about. You deserve to play, laugh and shout. Get well soon. 28) Your sickness may be your body’s way to tell you to slow down, smell your coffee, relax and stroll around town. Get well soon my friend. 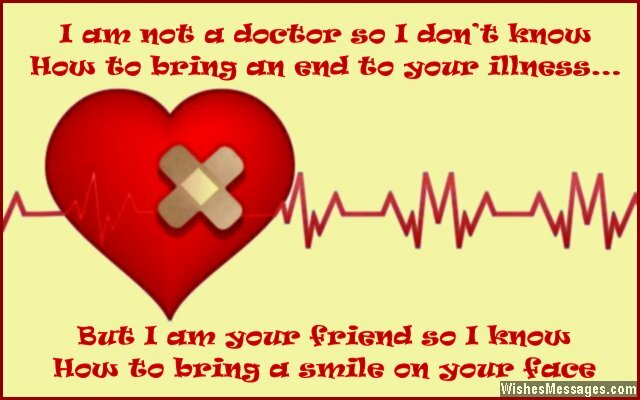 29) Friends can do what doctor’s can’t – make you smile. Friends can do what medicines can’t – make you laugh. Friends can do what sickness can’t – help you recover. Get well soon. 30) I may not have a medical degree but I do have friendship’s healing touch. Get well soon. 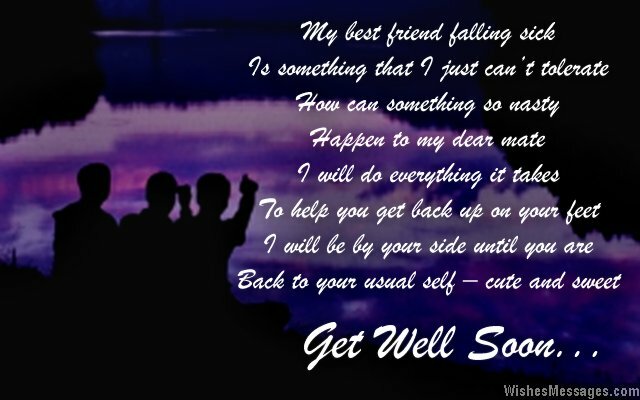 31) My best friend falling sick is something that I just can’t tolerate. How can something so nasty happen to my dear mate. I will do everything it takes to help you get back up on your feet. I will be by your side until you are back to your usual self – cute and sweet. Get well soon. 32) You better swing back into action fast, so that we can party and have a blast. Get well soon. 33) Your good health is what I will be praying for… morning, night and noon. I hope that the power of my prayers gets you up and about soon. 34) The sweet healing touch of a friend like me is all you need to drive your bitter illness away. Get well soon. 35) The BEAUTY of friendship is that it can make an UGLY sickness disappear. Get well soon. 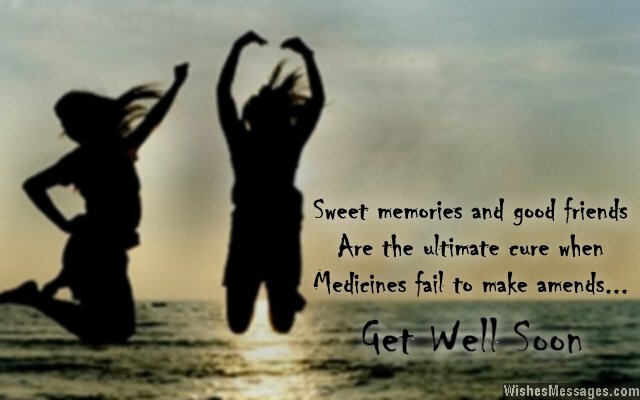 36) Sweet memories and good friends, are the ultimate cure when medicines fail to make amends. Get well soon. 37) My friendship with you is better than a doctor’s knowledge of the human body. Doctors only know how to prescribe medicines, whereas friends like me know how to make you happy. Get well soon. 38) Don’t worry my friend, I will take justice. I will beat the living daylight out of all the germs who have invaded your body. You just sit back, relax and focus on getting well. 39) Your illness has reached a boiling point because I am boiling over with frustration since we can’t meet. Get well soon. 40) If I had the chance I would tell all the bacteria in your body, to take mine instead of yours. Get well soon my friend.